CAPE MAY, N.J.-It’s a magical night when the switch is flipped to light Congress Hall’s Christmas tree – the centerpiece of their annual Winter Wonderland celebration. This year’s tree, a 30 foot Douglas Fir, was donated by a Forked River family, The Sullivans. Their tree was entered in the online search and was chosen out of dozens of entries. 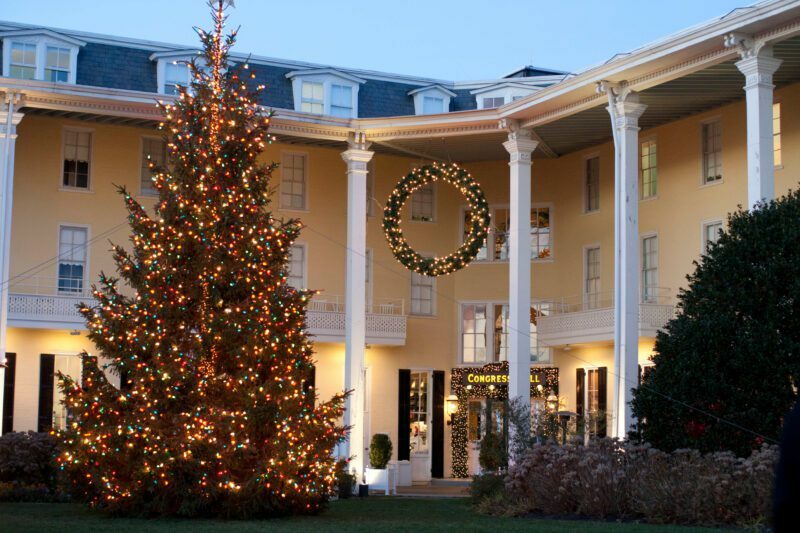 They will be at Congress Hall in Cape May to watch the tree light up for the first time this season during a ceremony Friday night, which is a favorite holiday event for Cape May residents and visitors. The evening starts at 6:00 pm with a concert in the Ballroom. Admission is free, but attendees are asked to bring a donation for Toys for Tots, a non-perishable item for the Cape May Food Closet, or a monetary donation of $10. At 7:00PM, the outdoor show featuring TNT & Friends leads up to the Choir performance and Holiday Sing-Along at 8PM, with the tree lighting immediately following the concert. With the tree lit, Victorian Carolers will follow at 8:30PM and a Brass Ensemble will perform at 9PM.